This past weekend was the bachelor party of one of my best friends and greatest mentors. A weekend in Vegas, fifteen guys from college and work, three suites at the Venetian, two suitcases of booze, and bank accounts that had want of emptying. All the trappings of an epic time and unforgettable stories. I’ll be the first to admit that I fell victim to the hype. It was my first ever bachelor party, and in the post-Hangover world, it seemed like absolutely raging for the two days was the only way to go. And rage we did. In our first thirty minutes, the group probably lost close to five hundred dollars playing craps. None of us felt particularly great for it, but walked it off and continued raging. Vegas has a lot of ways of parting you with your money, and they all involve an experience that’s commonly known to be epic. So you invest a little in the adventure, and if it doesn’t turn out to be as mind-blowing as in the movies, you invest a little more until it is. Oh, wait a minute. Throwing good money after bad sounds a lot like, well, irrational escalation of commitment. In the casino it’s known as gambler’s fallacy, and we knew immediately that the ROI on trying our luck wasn’t so hot. But in other cases it’s more subtle. You’re already in the club, so why not spend another grand for somewhere to sit? Or why not get the VIP treatment to make your night that much more story-worthy? From the first evening, I quickly realized that the most fun was to be found just sitting around in our hotel room, cracking jokes at dinner, or walking from place to place. I felt strangely disconnected whenever we were out at a party spot. That disconnectedness led me to have some really great conversations with other guys in the party, and I learned new things about their lives, perspectives, and histories. I had a flashback to a midyear Christmas at the age of 8, when my mom bought our first ‘big screen’ (32″) TV. How excited I’d been to get something everyone else knew was awesome. And then how I ended up having more fun cutting a hole in the box and making it into a spaceship. Here we were, at one of the most celebrated destinations in Vegas, and I was cutting another hole in a box. Something struck me about all the revelers in clubs, casinos, pool parties, and the like in Vegas. Sweaty, cramped, in debt, and smiling. I couldn’t help but remember a moment in tenth grade, reading The Catcher in the Rye. Holden describes the phoniness of adults, as when they act out their roles and emotions. In this resort world, it seems the most insecure people go the hardest, and act out having fun even when they’re not. What’s strange is that in a group of very intelligent guys, I found all of us (myself included) falling victim to the insecurity too. We constantly straddled the fence between our characteristic thoughtfulness, and our desire to have stories worth telling. Overall, the weekend was a win for irrationality and, perhaps, a failure of imagination. We walked away, mostly having had a great time in spite of the epicness, but telling ourselves those things were the very source of our enjoyment. I’m glad I spent the weekend with my friends, and would fly somewhere to celebrate life with them again in a heartbeat. But I’ll always remember that circumstances are nothing more than a catalyst for happiness. 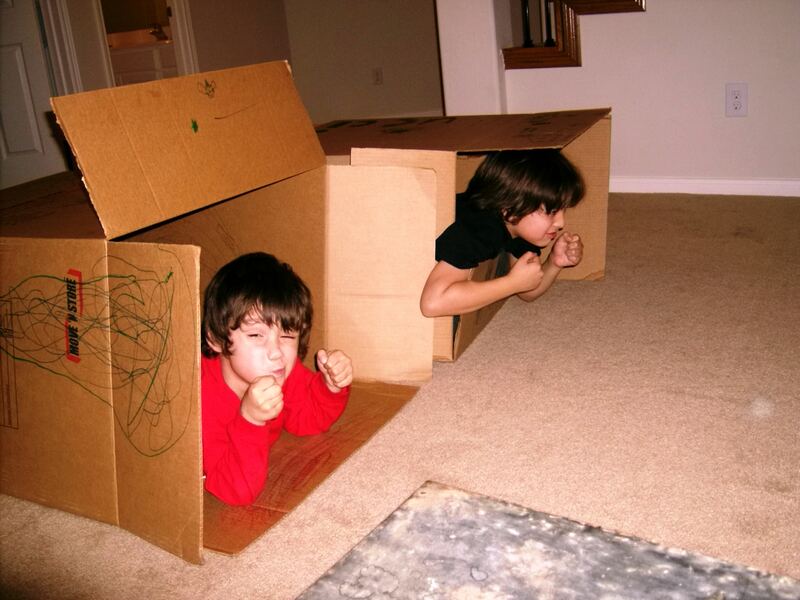 My kids are going to grow up with a lot of cardboard boxes.